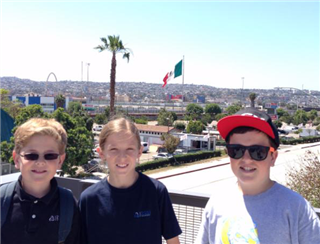 On April 9th, seventh graders traveled to San Ysidro as part of their study of borders and boundaries in Social & Community Studies class. Having examined the politics of the U.S./Mexico border, students were able to see the effects the largest land border crossing in the world has on the San Ysidro community. Barbara Zaragoza, author of San Ysidro and the Tijuana River Valley, gave the group a tour of the town's historic sites, and two representatives from Casa Familiar, a community development agency, provided students with a history of the community and information about the environmental effects of the border crossing. After lunch, the group drove to the border to walk the pedestrian walkway and observe the traffic, border security and historic border marker 255.